She walks down rapidly, a speed that belies what time it is. Her face is scrubbed, a hint of damp from washing her face and drying it. Her fingers are cold as they reach for my arm. Her lips are deliciously chill as they land on my cheek. “Good Morning Amma!” Pattu exclaims as she takes her seat at the kitchen island. It is always the middle. I slide her mug of warm latte and seat myself next to her with my strong cup of coffee. The cooker on the stove is still hissing as it releases steam. The idlis are done and vegetable pan seared and cooling before I can pack them for lunch. The steam coils and escapes into the ceiling. “Did Ammu and I trouble you a lot as a baby like Laddu does?” Pattu’s face is earnest as she asks the question. “No!” my answer is as instinctive as it is definitive. We talk about some of Laddu’s shenanigans before Pattu’s face goes serious. She talks about her birth mom and follows it up with “I am glad I have you as my mom even if you are a different color.” My hands seek hers. My coffee mug is empty and hers almost. We sit at 6:30 AM in the morning facing each other as I talk to her about our lives. We talk about how it is nice to be able to express what we feel without having to add rejoinders about why we love each other. We talk about why it is OK to love more than one person at the same time. We talk about why it is OK for her to favor one person more than the other at times. Most of all we talk. Heart to heart, mom to daughter, daughter to mom. The topic meanders to school and lunches. “A and W say my lunch smells like a rotten donut.” Even as I try to figure out what a rotten donut would smell like I remember the pan roasted cauliflower I packed for lunch the previous day. One that I had taken the time to stir fry on high heat until it was golden without a speck of black. One that was a perfect mix of crunch and fried. I stay silent for a moment and ask her if she liked what she ate. She nods and adds “I like my lunch Amma. I just feel sad when someone says that.” I agree and we talk about how bullies cannot exist in a vacuum. “Refuse to engage, starve them of oxygen, do not react or respond. They will walk away.” I say and promise to pack foods that do not smell as much in the future. She walks to the sink and sets her cup and fills it water with deliberation. I feel my heart swell with pride. I make my way to the kitchen and realize I am humming a tune. I am sitting next to Laddu as I cajole her into eating a spoon of keerai with rice for every spoon of yogurt she craves. Ammu drops her dinner bowl into the sink, wipes her mouth with the back of her hand and stands next to me before belching into my ears. “Ewww!” I say and open my mouth to reprimand her. She giggles and says solemnly “Everything you make tastes so good Amma. My stomach agrees.” I join her in laughter and revel for a brief moment before she follows it up with “This is my kind act for the day.” My face falls and she runs over to hug me. The kids have been talking about being kind and random acts of kindness and it amazes me how they seem to know instinctively what kindness is. I lie next to Laddu in a state that is neither awake not asleep. A lowered state of consciousness where I am aware of my breathing but relaxed to the point of minimal thoughts in my head. 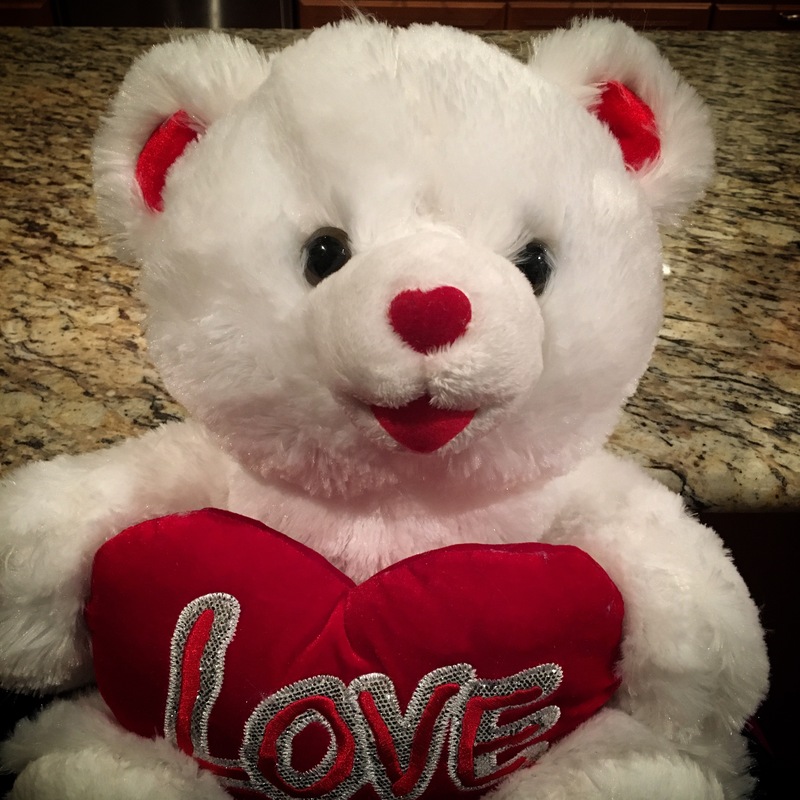 I hear movement next to my bed and open my eyes to two eager faces next to mine yelling “Surprise!” A white teddy bear with a huge red heart has LOVE spelled on it. It is sitting on my chest as if waiting for me to claim it. The twins are back from a grocery run with their dad and decide on impulse to get me something. I am more than surprised. I am overcome with gratitude and joy. I am overcome with emotion that my little girls can put others before them. I am struggling to understand how and when my babies grew into little girls who understand the need for tokens and symbols. I hug and laugh and cry. Long into the night I revisit the moment and feel my eyes well up again. Often I wonder what it would be like to have grown up kids in the house. I imagine serious conversations and a friendship of sorts. Days like today remind me that the future is not that far off. My children are growing up and fast. To respond to your last rhetoric, it is fantastic to have grown up (if teenage can be considered grown-up) girls in the house. The friendship that develops is something you’d have never experienced ever before. A couple of days back, V and I had a little chat in the kitchen, and I felt the same thoughts that you write about – how nice to be able to have a heart-to=heart conversation with someone, without pretence, without censoring and without fear of being judged. I love this post. Your writing is so heart-felt, your personality so beautiful as it envelops your family in its warmth and care. Skin color is a topic of curiosity and how easily the world prejudices this curiosity for them. But your post so beautifully captures that we are all multi-layered, multi-faceted personalities who can positively impact us and those around us. Made my day Laksh. Thank you. Your comment made my day! Thank you so much! This is super cool post. You are an awesome mom and writer. Your words flows like a river. I told my daughter she would be my BFF when she was 3. She still remembers after 3 years and reminds me almost everyday(especially when I say no). Anyway regarding food my kids never take Indian to school. One of her friends(Korean) came to a playdate and somehow told ended up saying “oh right, you donot eat human food, you eat Indian food”).I was going to interrupt then stopped myself and decided not to make a big deal. Oh how beautifully you write! I come back.here time and again I know not why.